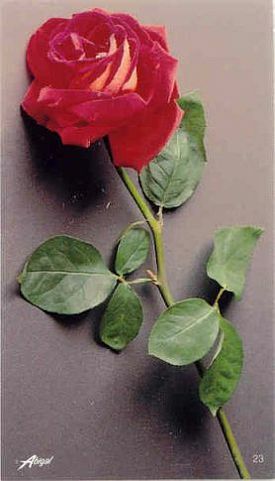 Terri J. Van Dyke, a "Native New Yorker" (just like the Frankie Valli song), was born on November 23, 1948, in Manhattan, New York City, at East Houston Street and Avenue D (as in "Drag" queen). 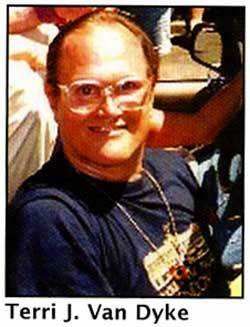 In the summer of 1962 during a heat wave, his abusive, over-the-top, divorced mother threw him "out in the streets" at the very young and vulnerable age of 13. Terri remembered, "A few years later, my favorite girl group, The Shangri-Las, came out with a chilling song called "Out In The Streets". As soon as I heard it, I said: That's me!" Ironically, 30 years later, that song was included in the wonderful Gay, Lesbian, Bisexual and Transgender ("GLBT") fill-lentgh feature movie "Stonewall" (1996). 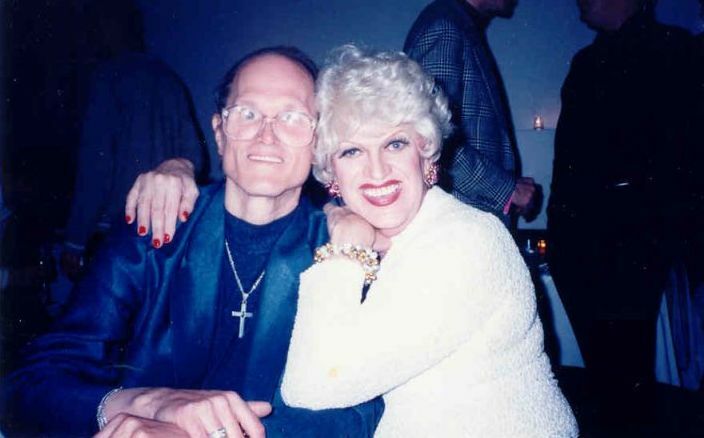 Terri was at the premiere of the film with his special friend Williamson Henderson, who was the Stonewall consultant on the movie. 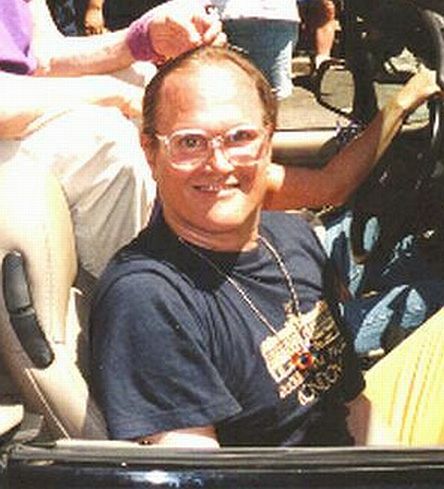 They arrived, along with Queen Allyson, Rayette McCaffrey and Leigh McManus, in the historic 1969 Cadillac open-convertible "Stonewall Car". Why did Terri Van Dyke's mother toss him out? Why else? "I remember well one time when I was about six years old, my Mother regularly took me to the neighborhood playground. The cute boy, Jimmy, from next door was there with his nice mother. We were playing in the sandbox with a bunch of fun toys. I kissed the boy! Although it was probably his first time, it wasn't mine. He liked what I did and I did it again (and again). His mother didn't care about an innocent gesture from another child. But, my Mother -- and I recall this vividly -- loudly declared: "It's time for me to get another child". In less than a year, my troublesome sister Melissa was born. Fasten your seat belts! My Mother lived to regret that wish!" 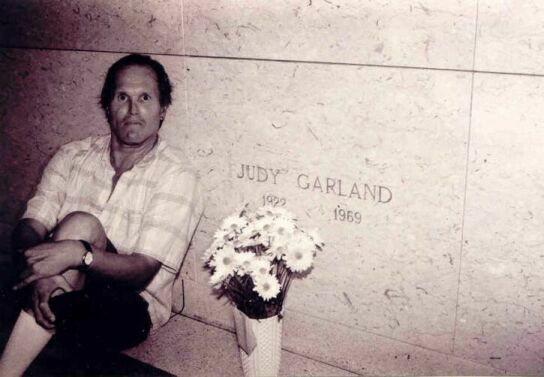 Seven years later, after his high-anxiety Mother gave him the real "86", Terri bummed a dime and called one of his "trix", who soon got him his own walk-up tenement flat on Spring Street on the Lower East Side. In the meantime, as an under-aged youth, he stayed with another older male trick. And to give Terri some sense of "family", yet another trick bought him a miniature collie dog that he gayly named "Butch". 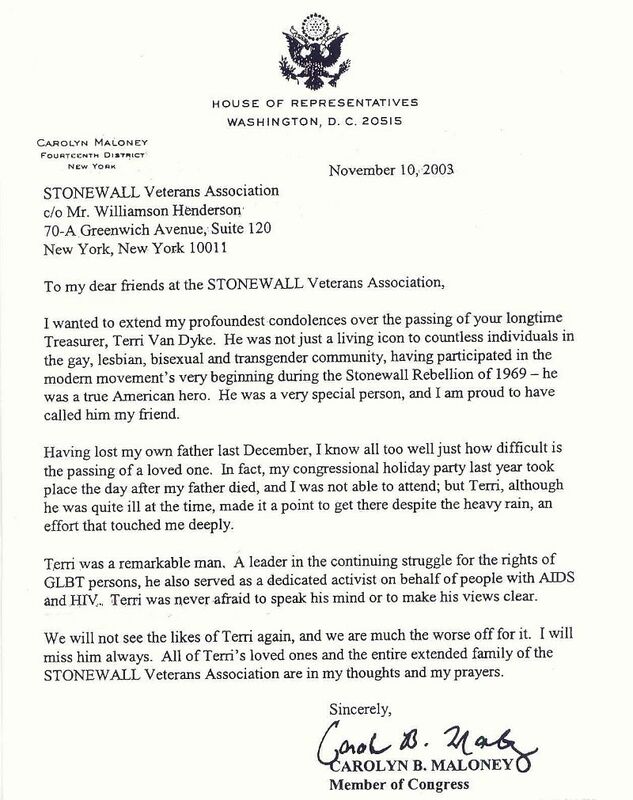 From that time, through the Stonewall Era, until 1974, Terri lived life vivaciously and precariously as a woman! Terri has uniquely lived every part of "G-L-B-T"! 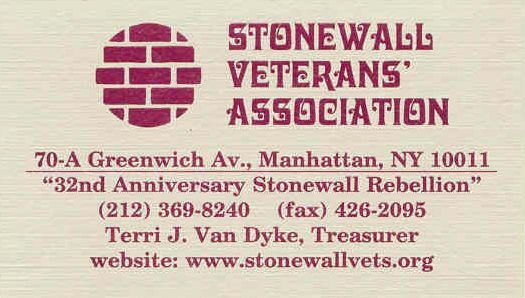 Terri J. was elected Treasurer of the STONEWALL Rebellion Veterans Association ("S.V.A.") 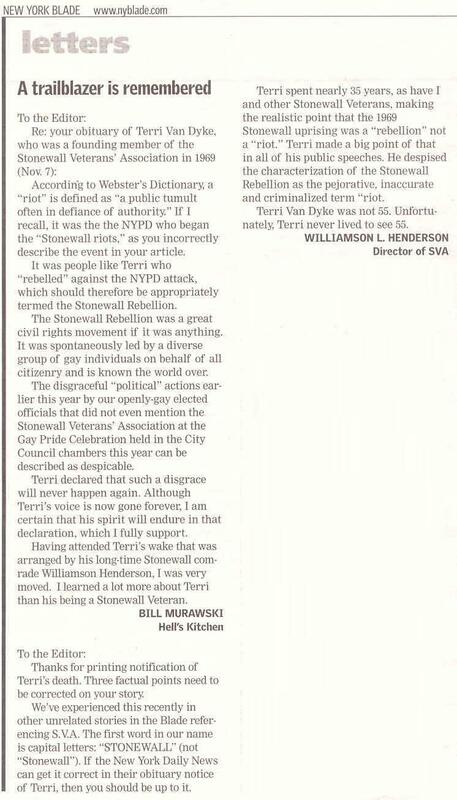 as of "Stonewall 25" in June of 1994. He has been unanimously re-elected every year as S.V.A. 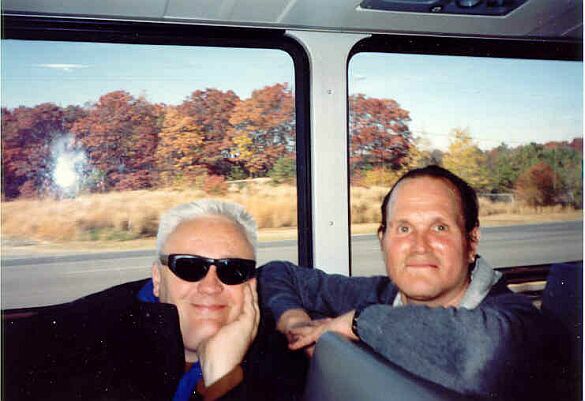 Treasurer for ten years through his demise in late 2003. 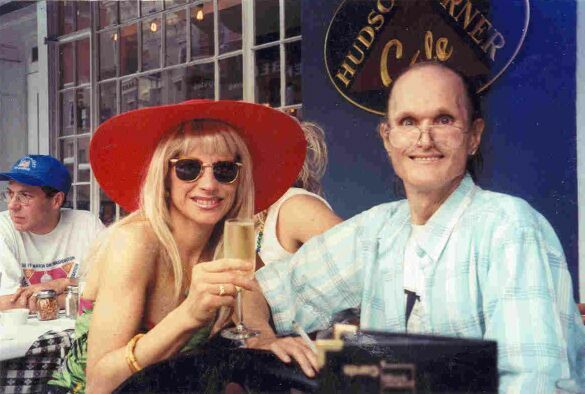 Terri at an SVA-sponsored "Stonewall Showtyme" at the Stonewall Cabaret Room, located directly above the original Stonewall Club, in 1998, with good friend Duchess Rayette of the Imperial QUEENS & Kings of Greater New York. Pictured above (l-2-r) are: Princess Jenni June, Vice-President of the Imperial QUEENS & Kings of Greater New York, with Terri Van Dyke. The scene is after the 32nd annual Gay Pride Parade, which the S.V.A. led, on Sunday, June 24, 2001, at the Hudson Corner Cafe for the annual "S.V.A. Stonewall Sunday Brunch". 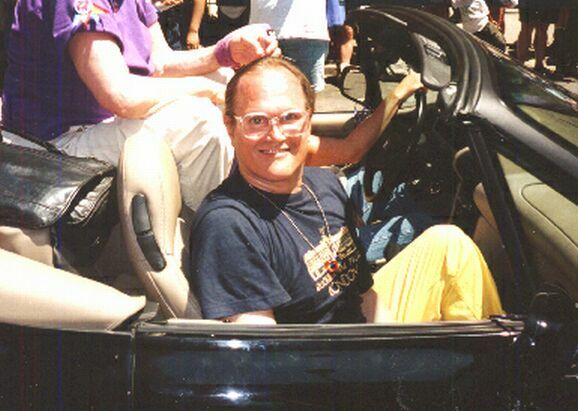 In left background is Greg Lambert (with blue cap), the GLBT Liaison of U.S. Congressmember Carolyn Maloney, who also marched in the Gay Parade with the S.V.A. and was present at the fun S.V.A. brunch. Just five days before the notorious "September 11, 2001" attacks in Manhattan, shown above are (l-2-r): Williamson Henderson, president of S.V.A. ; Jenni S. Egan, Vice-President of the IQKNY; Ray McCaffrey, Financial Secretary of the S.V.A. 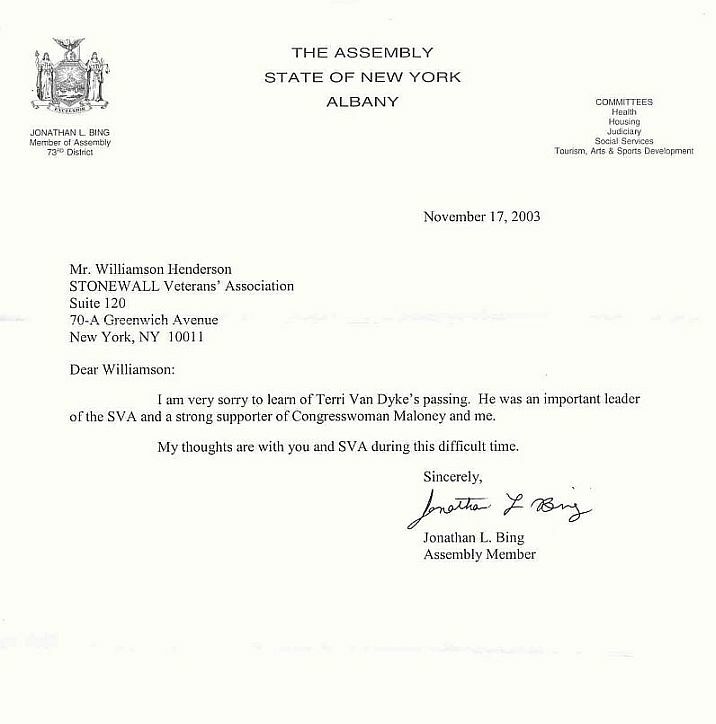 ; and Terri Van Dyke, Treasurer of the S.V.A., at a wonderful, pre-Election Day political party for New York City Council (District 1) candidate Elana W. Posner on Thursday, September 6, 2001 in Manhattan. Ironically, it took place at a beautiful loft apartment in the World Trade Center area. Terri gave a very civic and moving speech at the event about the upcoming Primary Day Election on September 11th. Terri worked part-time for the N.Y.C. Board of Elections. Unfortunately and sadly, said elections had to be postponed for two weeks due to the terror attacks on the World Trade Center on September 11th! Terri was working at an election polling place uptown in Manhattan when the attacks occurred. 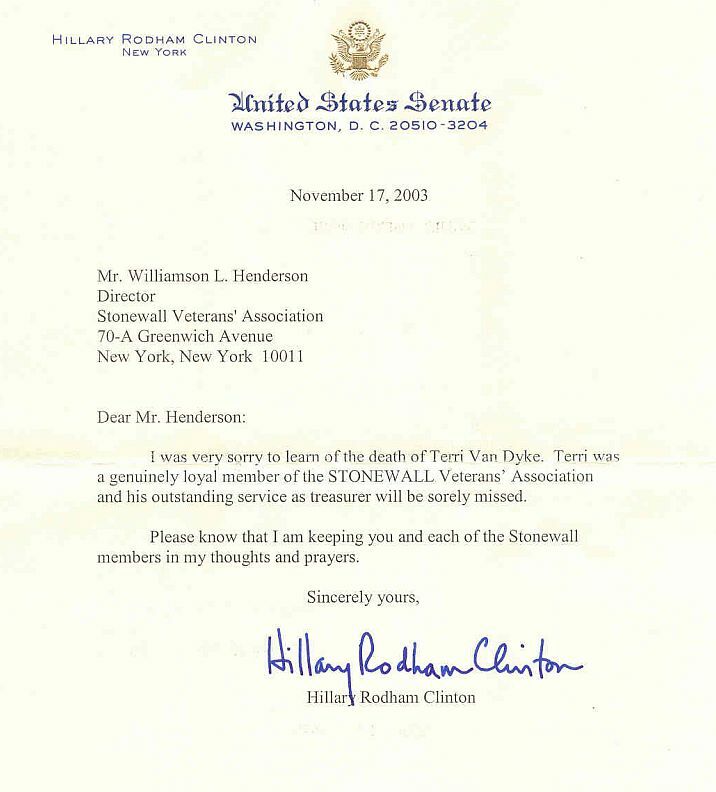 The election site was then closed and Terri was sent home (with pay). 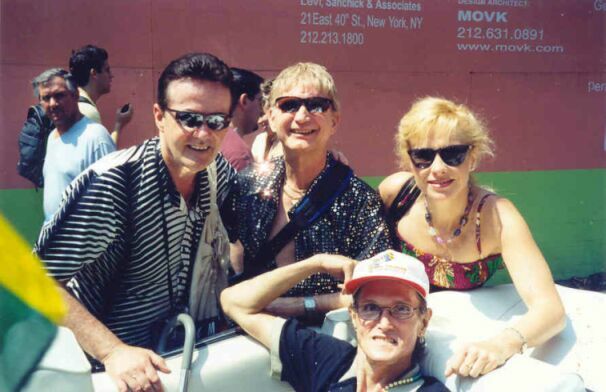 Terri Van Dyke parading in the famous "Stonewall Car"
Stonewall veterans Rick Rodrigues (left) and Eldon Garrett and the IQKNY's Princess Jenni June Egan surround Terri, waiting in the 1969 "Stonewall Car", at the N.Y.C. 33rd annual Gay Pride Parade line-up on Sunday, June 30, 2002. Viewing at Funeral Home: Thursday, November 6 from 6 p.m. to 9 p.m.
Terri Tribute Speeches @ 8 p.m.
Floral arrangements were received from: Terri's parents Robert and Lillian; Williamson, AnDre and Jazzpur (Terri's cat); Leigh McManus (no relation), STONEWALL Veterans' Association; Queen Allyson Allante, Imperial QUEENS & Kings of New York; Greg Lambert & Will Weder, Village Reform Democratic Club; and Marlon Hunter, PRIDE Democrats. 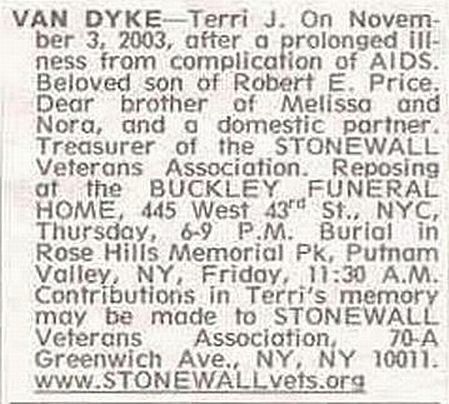 "Stonewall Vet Dies: Terri Van Dyke"
Burial: Rose Hills Memorial Park, Putnam Valley, New York. The referred Domestic Partner is another SW-Vet! 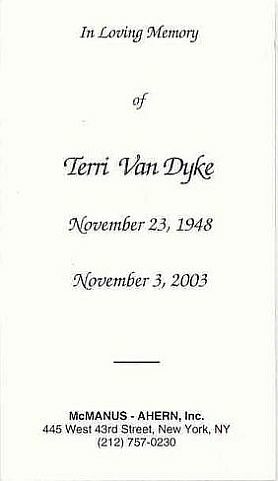 More Terri Jordan Van Dyke biography will be presented. More pictures of TVD will be posted at this S.V.A. webfile. We welcome any other pix of Terri to be sent to the S.V.A. When it comes to website input, due to funds, we're slow... but sure!